"We spent a wonderfully relaxed week at this accommodation in the tranquil locale of St. Mediers. On arrival, we were welcomed by the owners who were extremely friendly, welcoming and hospitable. They lived nearby, giving assurance and help if required. The property was extremely clean and well-appointed with beautiful scenic views from the sun terrace. There were plenty of facilities and access was easy. The swimming pool was clean and most welcome. The pretty hamlet of St. Mediers is quiet, but the nearby town of Uzes is within about 8 km, where there are an abundance of quaint restaurants, shops and historic places of interest. 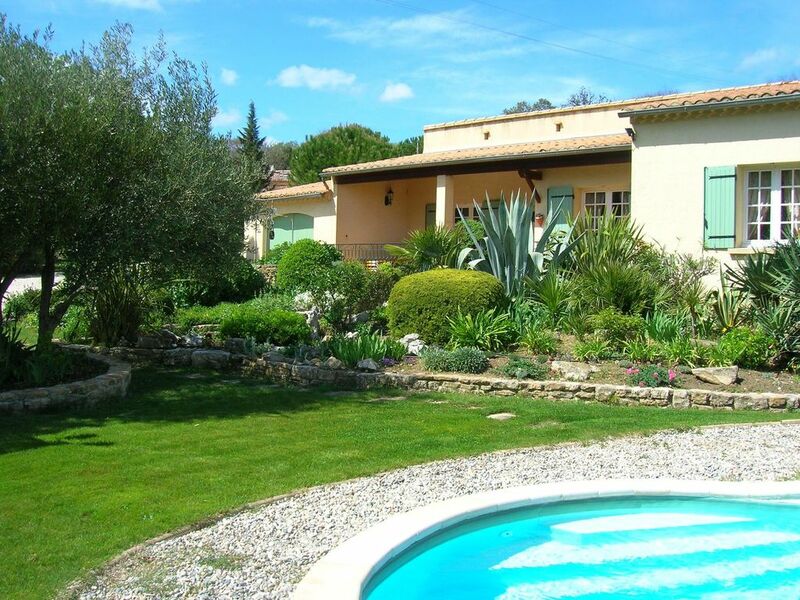 We have no hesitation in recommending this property which would suit all members of the family. We would certainly like to return ourselves!" We spent a very enjoyable week staying at L'Oliveraie. The amenities in the villa are excellent and everything that could be needed is provided. The location of the villa is beautiful and tranquil, surrounded as it is by vineyards. We gladly recommend this villa. "SUPERBE MAISON QUI DONNE ENVIE D''Y DEMEURER EN PERMANENCE TRES BELLE VUE ET DES HOTES MERVEILLEUX. TRES SYMPAS, ACCUEILLANTS, DISCRETS. NOUS AVONS PU GOUTER UN EXCELLENT VIN ISSUS DE LEURS VIGNES ET UNE HUILE D''OLIVE DE QUALITE. DE PLUS ON PEUT FAIRE DES BALLADES TRANQUILLE BON EMPLACEMENT AVEC DES ENFANTS QUI PEUVENT PROFITER DE LA TERRASSE ET DE LA PROXIMITE DE LA NATURE. EGALEMENT BEAUCOUP D''ESPACE INTERIEUR AVEC UNE BELLE CHEMINEE POUR DES SOIREES AU COIN DU FEU. NOUS REVIENDRONS"
"Passez les fêtes de fin d'année 2010 dans un tel environnement ne peut-être qu'un pur bonheur. Entre la qualité de l'accueil, la gentillesse des propriétaires, le calme et le charme de cette superbe maison provencale, toutes les conditions étaient réunies pour réussir un séjour de très haute qualité." "Als Familie mit zwei Kindern haben wir uns zwei Wochen lang im Ferienhaus der Ferrands sehr wohl gefühlt. Die Vermieter sind ausgesprochen liebenswürdig, Haus und Garten sind äußerst gepflegt und die Umgebung bestens geeignet, um erholsame und anregende Ferien zu verbringen." "Une villa tout à fait conforme à la description dans laquelle nous avons passé un agréable séjour. L'équipement est plus que parfait, l'environnement très agréable et calme. Idéalement située pour découvrir cette magnifique région. Les propriétaires sont charmants, discrets tout en étant présents à notre moindre demande. Une adresse à conserver soigneusement pour un autre séjour, ou à conseiller à ses amis."